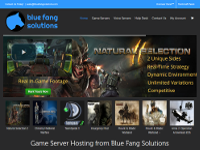 While Blue Fang Solutions is a young company, the staff are industry veterans working in many different hosting environments. We know what it takes to provide the best game server hosting possible. We are always learning and sharing our experience. So if you ever have a question or a suggestion don’t hesitate to ask. Our friendly and experience support staff is standing by to help. Accessible via multiple support channels you can reach us using our Ticket System, E-Mail, Teamspeak and Live Chat. We know having a responsive support system when running a server is important. That is why we offer so many ways for you to get the help you need with your game server hosting. Using the latest enterprise and enthusiast consumer grade hardware from E5-2620, e3-12xx and I7?s. We have the computational power and single thread performance that game servers demand. We know that performance is paramount to an enjoyable experience. That is why we spared no expense to bring you the latest and fastest hardware. I have been working on and off with bluefangsolutions for about a year and a half. Their support is great, one of their support guys even set up my webserver for me because I was a customer and he tough me a lot of stuff. The servers always run great and they leave atleast a 20% gap of unused cpu and ram on each box meaning no lag, and no over selling. I highly recommend this GSP.